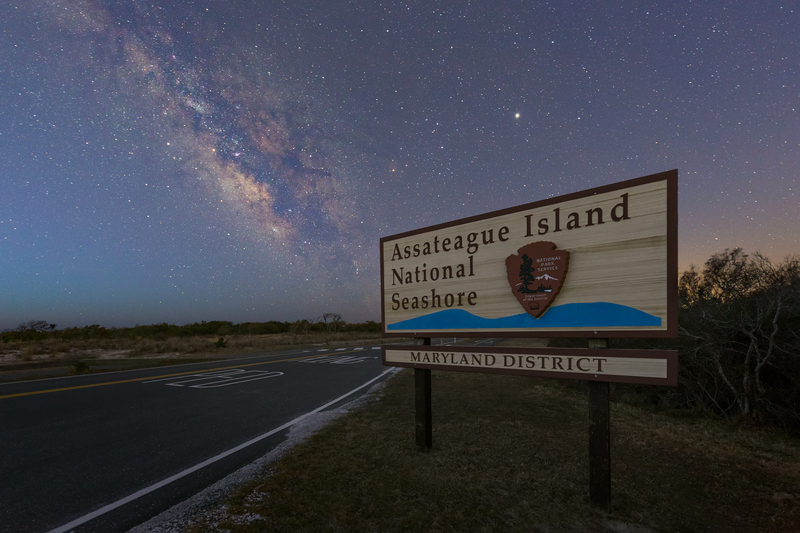 Welcome to Assateague Island! After last years constant wind and 20 degree over night adventure here, I had to push myself to go back this year. Fortunately, the temperature was forecast to be in the 30’s, which was practically tropical in comparison. 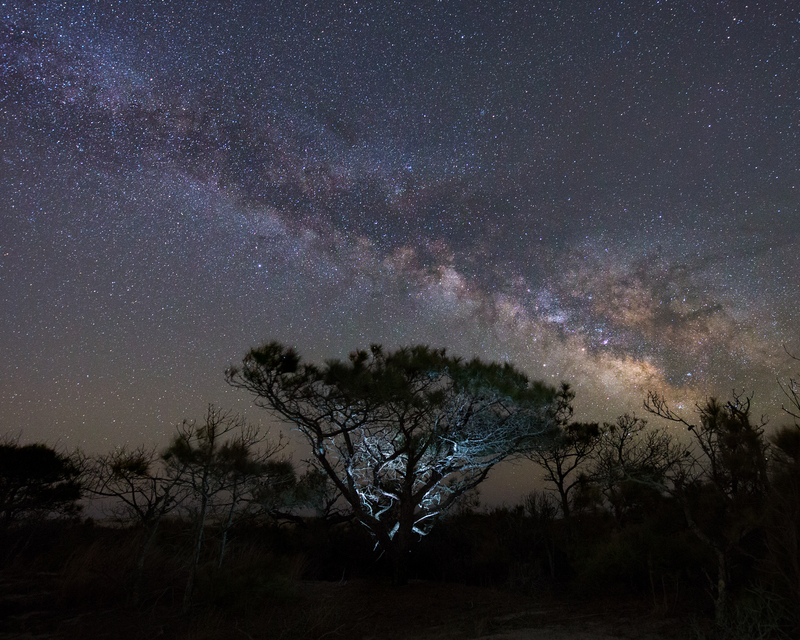 I recently purchased a new lens (Sigma 14mm F1.8 DG HSM Art) which seemed to have been made for night photography. I’ll be honest, I really enjoy taking photos of the night sky, and hope to continue doing so for many many years. I find it a challenge on many levels, and I hope to capture a few unique images to share along the way. Upon the my first night here, I was with four other photographers. We had the oddest bank of clouds that would not move. 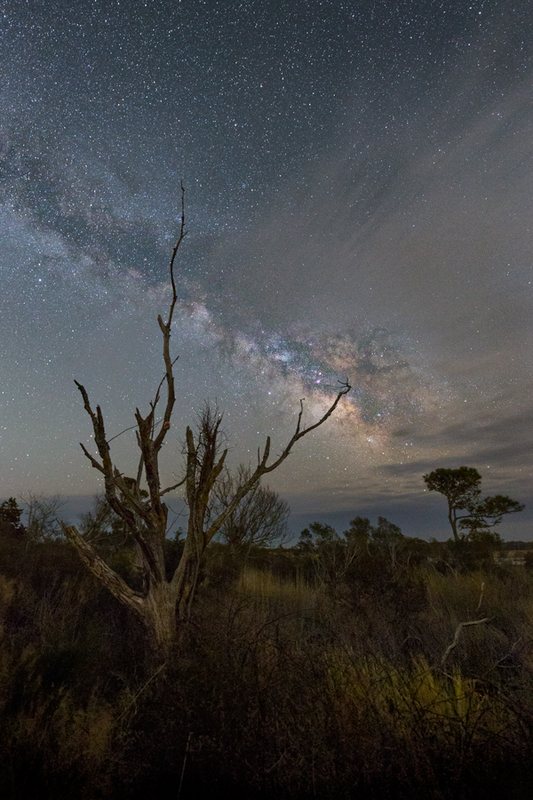 As the Milky Way rose over the Atlantic Ocean, that bank of clouds that would not move kept shedding off thin layers that would skate across our view of the skies. While waiting and taking test shots, I had decided to move somewhere else to see if I could find something for later on. 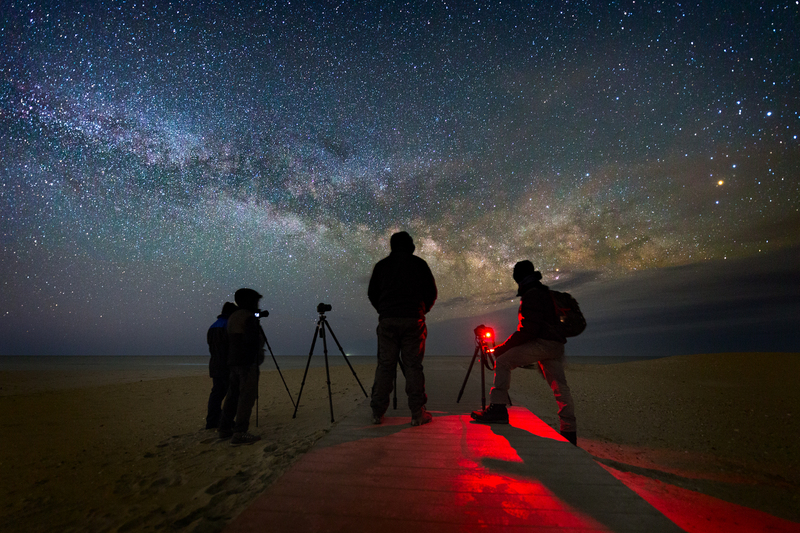 When I looked back I saw this scene, and yelled out to everyone, “Stand still for 20 seconds!” I think this helps tell a story of night photography. From the slow reveal of the night sky, to the annoying red light that tends to ruin shots for anyone standing near you. Ever wonder what it would be like to be able to stars like this everywhere? 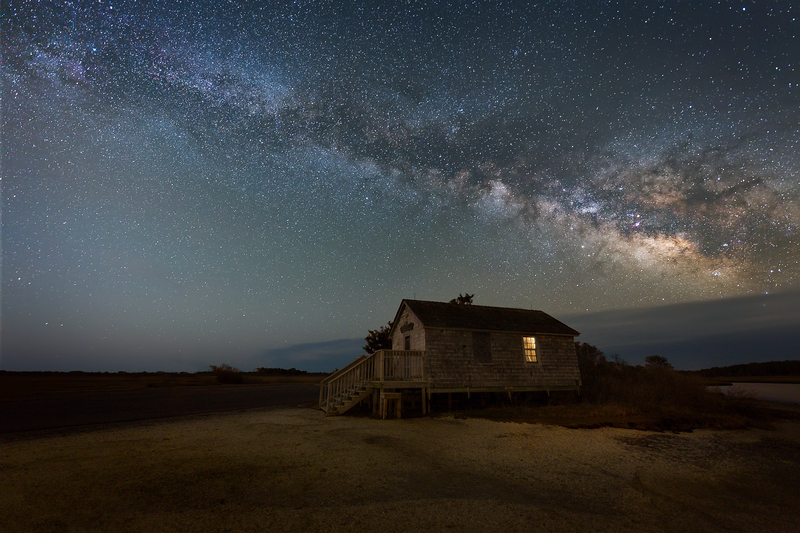 Unfortunately, there’s just too much light pollution along the East Coast where I live to see anything close to this. The following weekend, I made another last minute decision to go back. The skies where certainly clearer then the previous week. 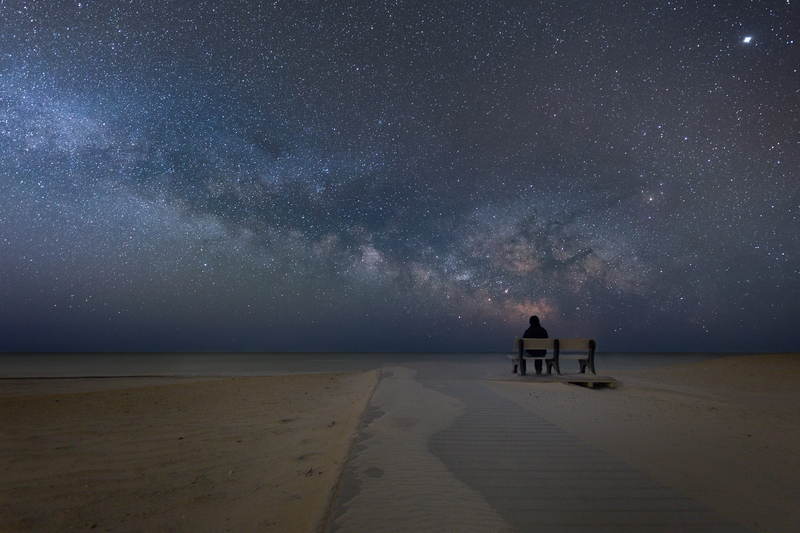 For me, there’s nothing like the tranquility of the roaring ocean combined with a view of the vastness of our galaxy. It’s nice to just sit, take it all in and dream. You can really put life into perspective this way. This might be my new favorite shot from here. Walking around in the dark staring at these dead trees stirs up something dark in the imagination. Sometimes those twisted and gnarled dead trees just seem to come to life in the dark. If there was a B horror movie that has the subject of automatonophobia (fear of any inanimate object), it should film a scene here. I have yet been able to do a star trail here though. I am 100% going back again though. There are more areas to explore, and more ideas to try out. Maybe I’ll even go back when it’s above freezing, but where’s the fun in that? 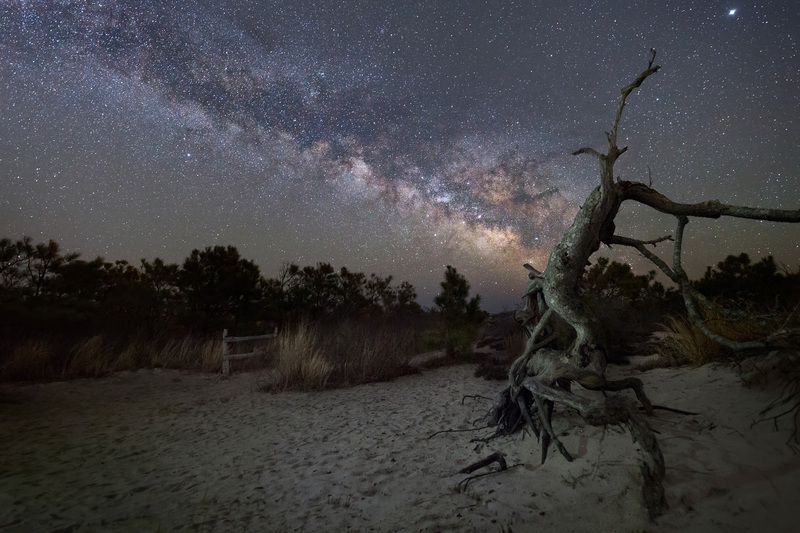 This entry was posted in Adventure, Assateague, Beach, Milky Way, Uncategorized and tagged Assateague, Assateague Island, Jason Gambone, Jason Gambone Photography, Maryland, Milky Way. Whoops! Yes, the 14mm 🙂 I wanted to get the post out and there was minimal editing and reviewing. I’ll update it now thanks Peter ! Great set of images Jason. Your passion for the night sky is obvious here. I love your experimentation with the foregrounds and the last 2 trees are awesome. I also wouldn’t regret the cloud bank. Frankly, to me it adds a dimension that helps the transition from the earthly to the celestial scenes. That lens looks like awesome glass. It’s hard to tell from these small web images, but the edge sharpness looks outstanding. I’m hoping to move into the Pinelands for a set this year as well. As challenging as it can be, I still want to give it a shot. It’s fun for me to try and come up with unique ways to light up something in the foreground, without blasting it with light. Thanks Rich. I especially love to shots from Maine – have spent a lot of time in Penboscot Bay, Fox Islands. You’ve perfectly captured the bleak deep beauty of life persevering on rock! Hope you get some good materials in western PA. Thank you very much! I do hope I get a few good shots from there, it’s just a matter of Mother Nature cooperating.